You’ve developed your product, crafted your website and you’re ready to do business. Now where are all those lovely customers? If you don’t know, the question you should probably be asking isn’t where? at all, but who? Who is all of this for? So just for a second, let’s think about who your ideal customer is. Really visualise them in your mind. And now ask yourself something else. Is that picture based on anything but your own assumptions? Whatever business we’re in, we often make lazy assumptions about who our customers are. We believe that we instinctively know their tastes, share their values and understand their problems. We assume they’ll be immediately interested in everything we have to say – and given half a chance they’ll be beating a path to work with us. But we all know what happens when you assume, right? In today’s customer-centric world it’s mission critical to design your products, customer journeys and your marketing communications with your customers firmly in mind. And for that, guessing just doesn’t cut it. You must know without a doubt who you’re talking to, so you can be just as sure about what you’re saying. If your customers haven’t turned up yet, it could be time to be bit more structured in your approach. Creating a customer persona will help you think about who your customer really is and how you can reach them. The idea is to build up a realistic picture of the person your product or service actually speaks to. Think about what they like, where they spend time and why they’d choose you over the other guy. Leave no stone unturned. Use magazine clippings or doodles to build a mood board if you like. This is an insightful exercise often used by brand consultancies, and we encourage doing it with members of your team. We have a handy worksheet below to get you going if you need. Start with your existing customers. Specifically the ones you love to work with. Think about what makes those projects go really well. We all want more of those kinds of relationships. Understand who those customers are so you can attract more of them. If you have no existing customers, think about who your product will benefit. Don’t fall into the trap of focusing on an unrealistic hit list. Think about what you offer and who needs you rather than who you’d like to work with. 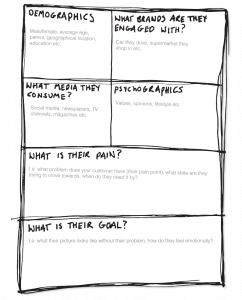 Having your customer persona mapped out means no more guesswork. Engage with the process properly and it’s like creating a window directly into your customer’s world. So when you sit down to develop a new product, design a customer journey or write marketing copy, you can see exactly who you’re talking to. It sounds simple. But that’s the kind of insight that allows you to align your business perfectly with your clients’ problems. And that’s when your ideal customer stops becoming a figment of your imagination, and starts spending cold hard cash. Know your ideal customer, grow your business. If you’d like more on customer persona and crafting your business message to resonate with your target audience, you can download our book ‘Content Pizza’. It’s on the house.